For all the modern convenience of long haul travel it’s hard to avoid the sleep deprivation and body clock somersaults. Even harder to avoid the compression on your immune system and likely exposure to every germ carrying human being you are sandwiched into close proximity with. I seem to have collected a plethora of nasties on my travels and been huddling with the pack indoors this week having a personal pity party. To say I’m disappointed is an understatement. I had grand plans for a gentle reintegration into domestic life. A spot of pottering in the greenhouse followed by some gentle weeding. And if needs must a session getting reacquainted with the duster and toilet brush. The best laid plans have had to be set aside for rather more sedate return to New Zealand life. After a waddle with the hounds with them moving rather faster than me has been about all I’ve been able to manage. My immediate taming efforts in the greenhouse left me wanting for another lie down. Any notion of anything more athletic or energetic has left me hiding under the duvet and crawling into bed for an early night. But today I feel much better. Not totally fit and well but well enough to reactivate my brain. It’s a small price to pay for my wonderful two weeks back in the homeland. Although it would have been nice to have had extra air miles instead. The bassets and I are back in a rhythm of life like I’ve never been away. Mason seems to have forgiven me, almost. I have a plan for baking them some treat biscuits this weekend as a belated birthday since their turned four whilst I was away. Hard to believe that these large lounge lizards are the same puppies that came to live with us when they were just 9 weeks old. 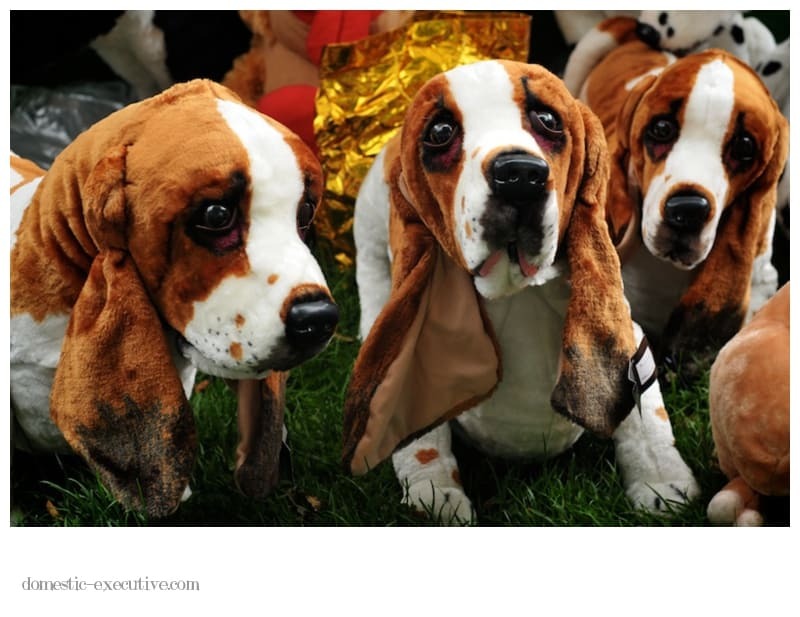 I couldn’t resist the bassets in this photograph who were pleading with me to take them all home from the food fair in Hexham. I resisted on account of the luggage restrictions sneaking one to our friends’ children who have been deprived of a canine friend by their father (bah humbug Nat!). As if to commiserate with me the weather has been truly dreadful since coming home but things are looking up for the weekend just as I’m ready to rock and roll again.